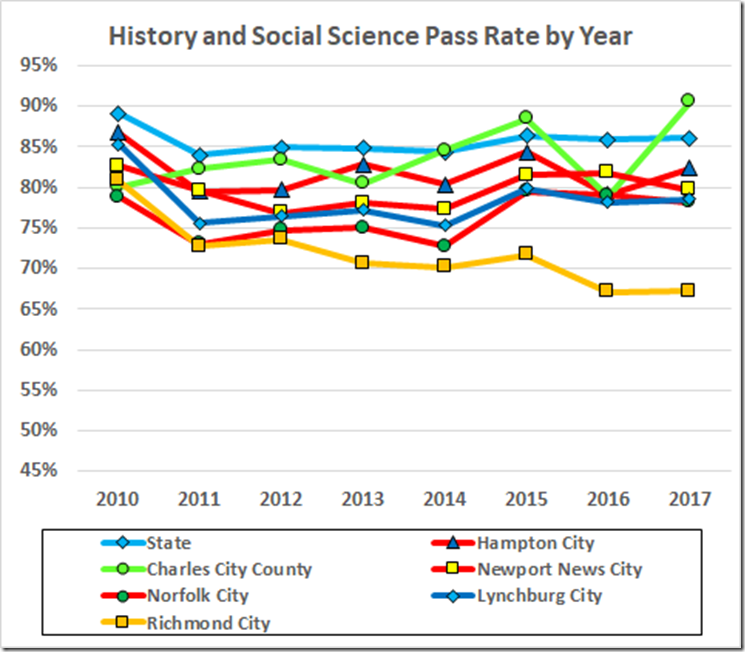 The 2018 SOL pass rates are up on the VDOE Web site. 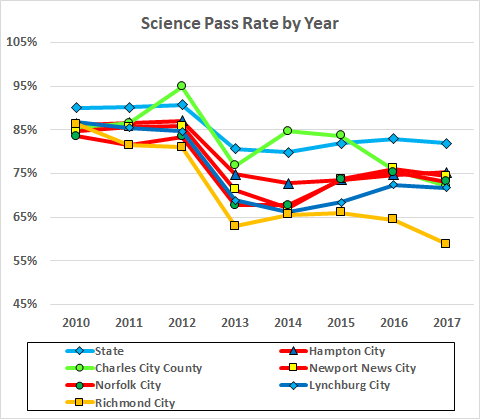 Richmond this year posted a one point gain in the average reading pass rate and a repeat in science but declines otherwise. 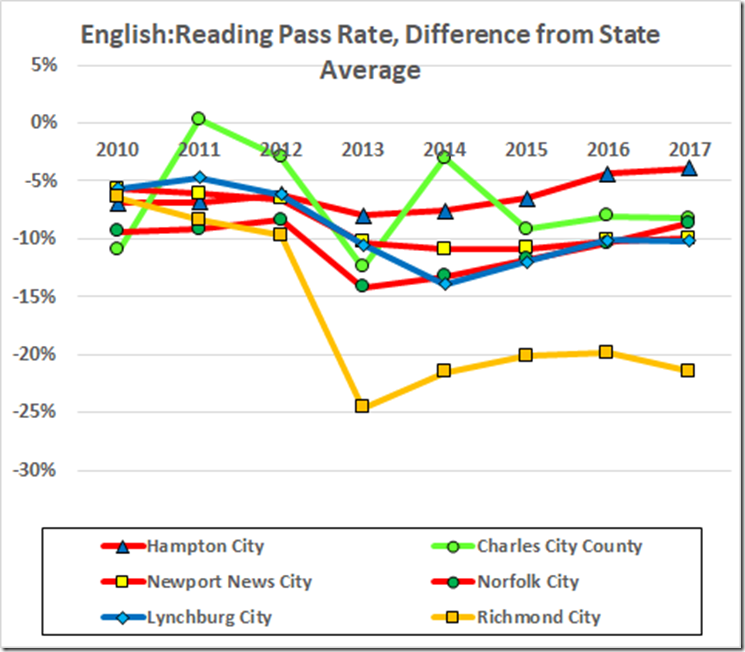 Recalling that the accreditation benchmarks are 75 in English and 70 otherwise, this is a picture of abiding failure to properly educate Richmond’s schoolchildren. With a 1 point gain in the reading pass rate, Richmond was third from the last among divisions, after a tie for second last year (not counting the School for the Deaf and Blind). 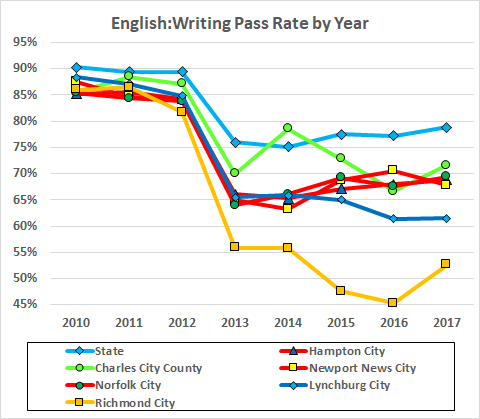 Notwithstanding the 3 point drop in Richmond’s writing pass rate from last year, Petersburg’s sixteen point(!) 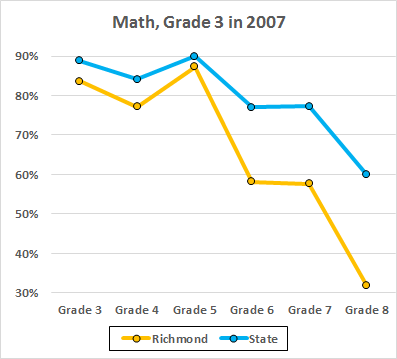 decrease brought Richmond up from last place to second from the bottom. 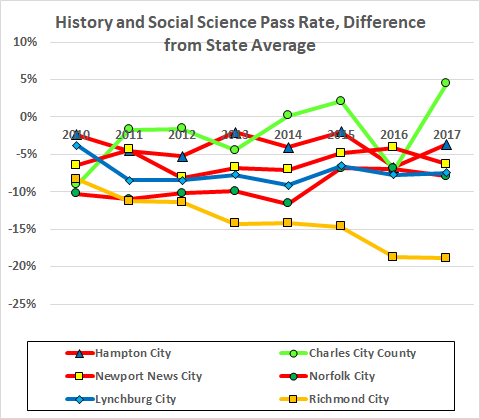 In history & social science, Richmond’s 5 point drop left it next to last, again. 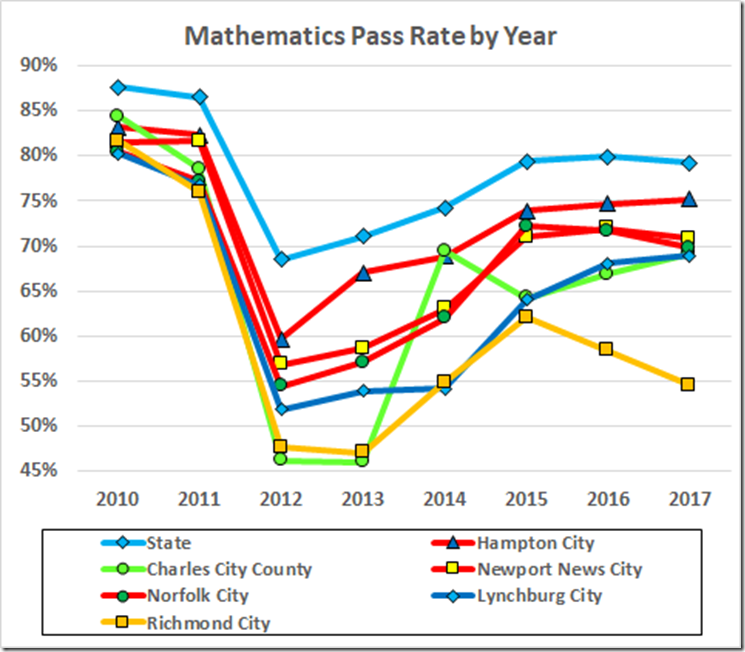 The 2 point slide in the math rate was small enough, in light of even larger declines elsewhere, to bring Richmond up from second to fourth from the bottom. Finally, the repeat pass rate in science was enough to leave Richmond in a tie for second from last, after a second place finish last year. 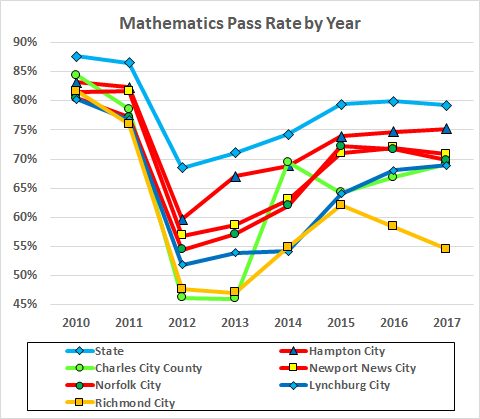 I’ll have more to say later about the relationship between this ongoing disaster and the State’s (predictably futile) intrusion into the Richmond school system. 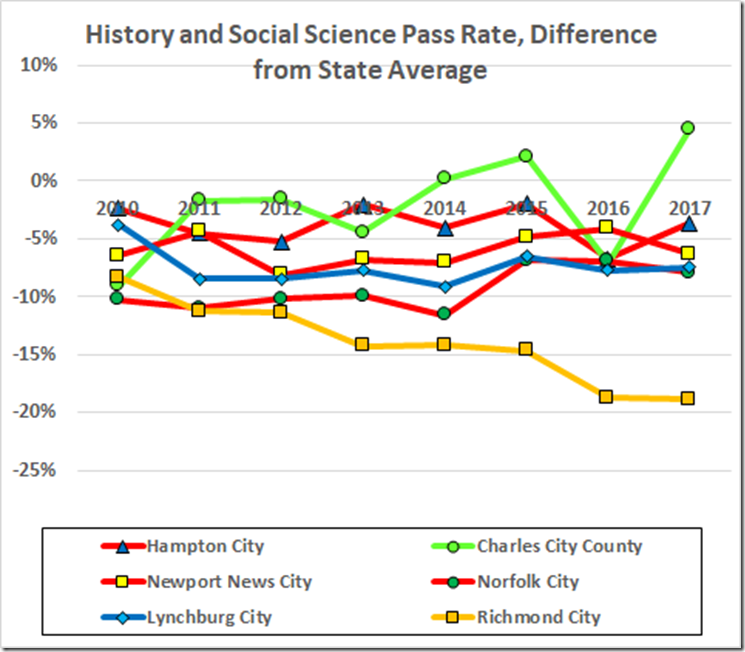 The SOL pass rates on the VDOE Report Card page gave a preview of the Bad News for 2017. The (very nice) front end to the SOL database now reaches the 2017 data so we have some context. NOTE: Corrected from the earlier post. 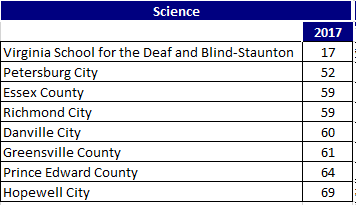 There was a sorting error in the VDOE database. Thanks to the always helpful Chuck Pyle for getting it fixed, quickly. 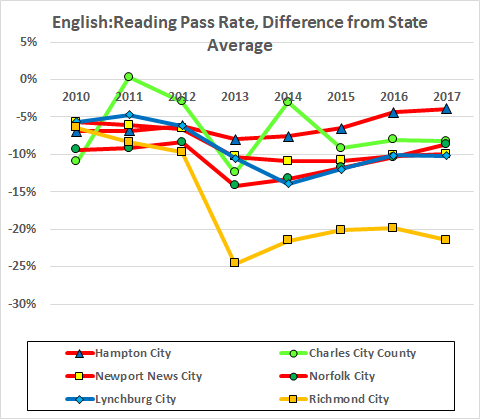 To start, here are the division average reading pass rates back to 2010. 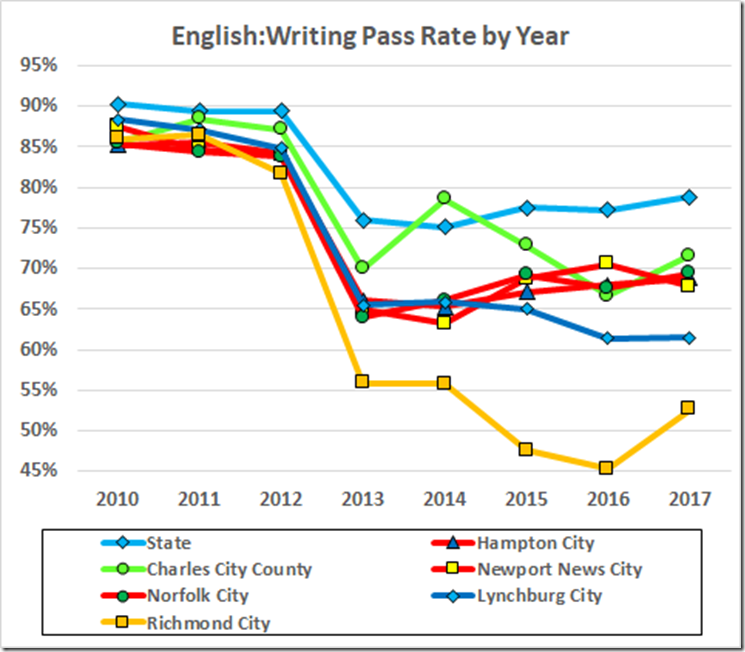 The dip in 2013 coincided with the new, tougher English and science tests. I’ve included data for the peer jurisdictions, Hampton, Newport News, and Norfolk, as well as for Charles City and Lynchburg (where I’ve sometimes been known to have a reader) and the state average. 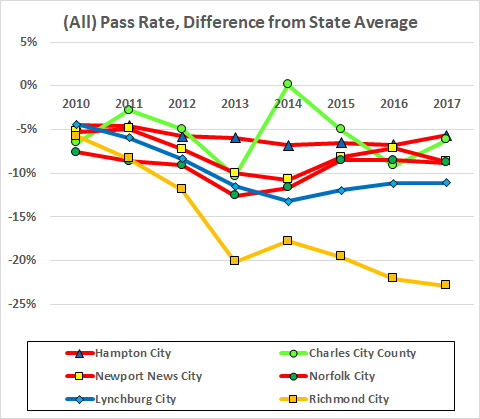 As a measure of relative performance, here are the same data, expressed as differences between the division pass rates and the state average. 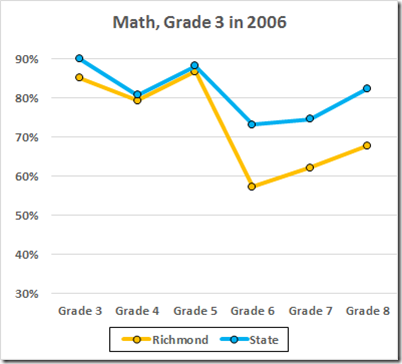 The drop in 2012 coincides with the deployment of new, tougher math tests that year. 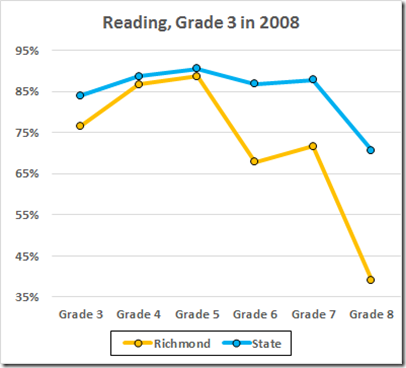 It ought to be unconstitutional to do this to Richmond’s schoolchildren. 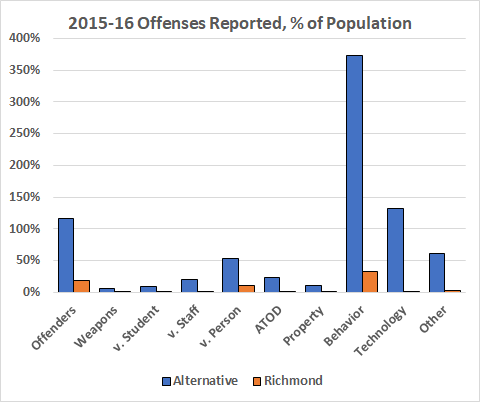 We have seen that Richmond’s receptacle for disruptive students, Richmond Alternative, was doing a remarkable job with a tough crowd until RPS took it over from the contractor in order to save $2 million. Pass rates then plummeted. Richmond now has reconsidered and has handed the school over to another contractor. The estimable Carol Wolf asked about offenses at Alternative. 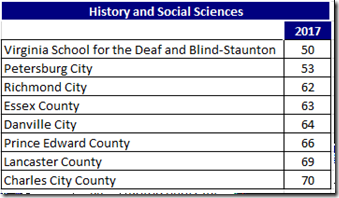 The “Safe Schools Information Resource” on the VDOE Web site has a plethora of data on that subject. 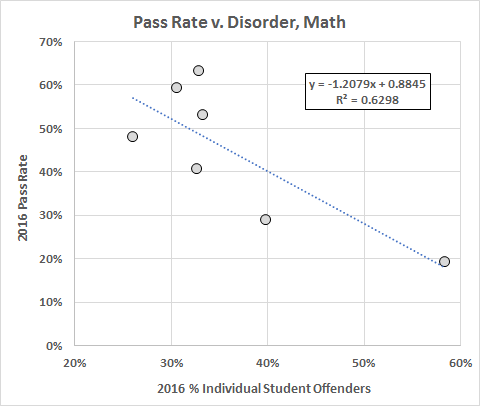 Here are the 2015-16 data, expressed as percentages of the school population. As I said, a tough crowd. The “Offenders” category lists the count of individual offenders. 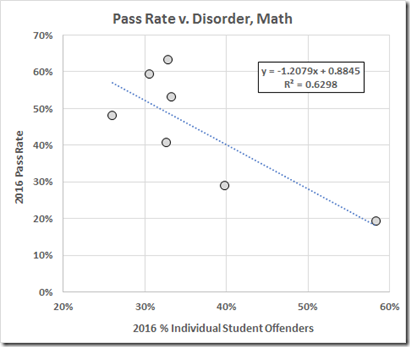 The only way that can exceed 100% is for the population count to measure the population at one moment in time while the number of students moving through the school is large enough for the count of offenders to exceed that population count. 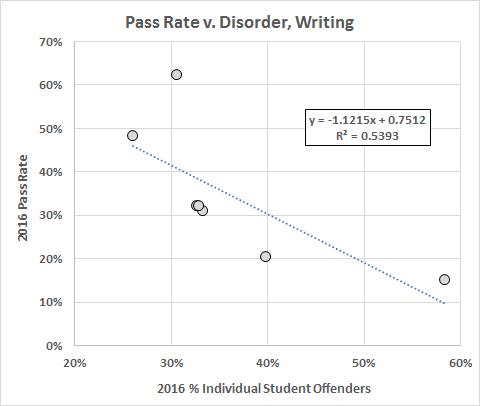 Looking over the list for second worst, I see that MLK (where the pass rates are similar to those at Alternative) comes closest to Alternative with a 58% rate of individual offenders. So, by any measure, Alternative deals with a tough clientele. The bottom line remains, however: RPS has demonstrated, convincingly, that it cannot manage Alternative nearly as well as the original contractor could. 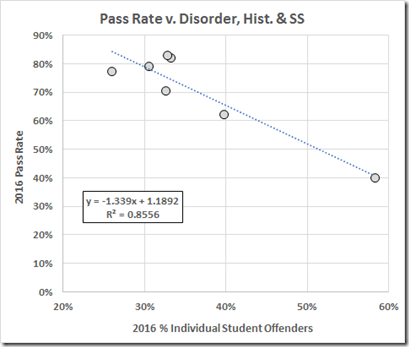 And that $2 million “saving” came at the cost of large decreases in the pass rates of that tough clientele. A division-level Memorandum of Understanding and Corrective Action Plan are expected to come before the Virginia Board of Education by June 22, 2017. One need not suffer beyond the first few elements in the template to see that it is not a Plan. It is a list of items to go into a Plan. Create, implement, and monitor a comprehensive plan to ensure alignment between the written, taught, and tested curriculum. Develop and implement a plan for division leadership to conduct instructional walkthroughs at all schools, analyze data collected on walkthroughs, and use the data to make decisions on how to support schools. 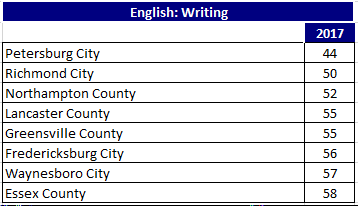 Develop, implement, and monitor programs for students with limited English proficiency compliant with state requirements. Thus, we see that, in the 172 days since November 17, Richmond has done nothing but create a laundry list of issues to go into a Plan. If they somehow manage to “vet [this or some other document] with RPS administration” and subject it to public comment and have it approved by the School Board, all by June 22, they still will have nothing more than a plan to create a Plan. But, what the heck! The Board of “Education” that is vested with “supervision of the public school system” does not know how to fix bad schools. Indeed, they admit it (Sept. 21, 2016 video starting at 1:48). It is merely an outrage that we are being taxed to support this sterile (and lethargic) bureaucratic exercise. It is something beyond an abomination that, in the meantime, Richmond continues to victimize many of its schoolchildren. 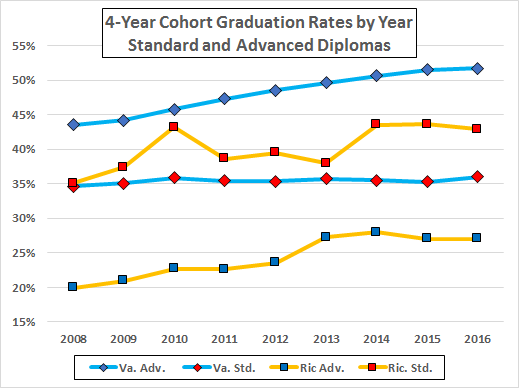 The VDOE has 4-Year cohort graduation data going back to 2008. 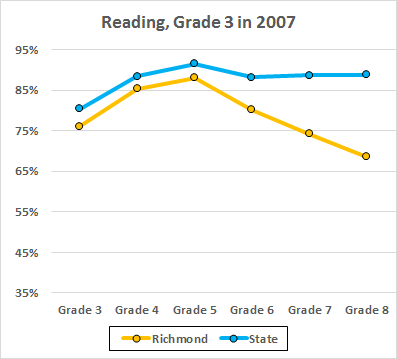 Here are the graduation rates for Richmond and the state. 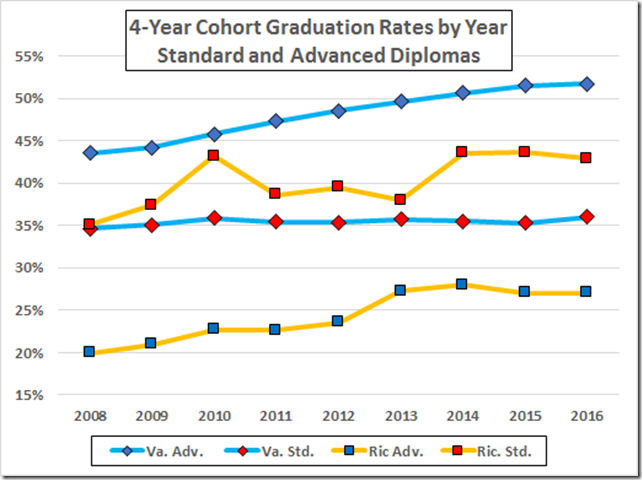 BTW: These are the actual rates, i.e., advanced + standard diplomas (aka the federal graduation indicator), not VDOE’s inflated “on time” numbers. 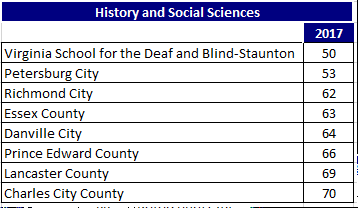 In terms of 2016 numbers, 443 of the 1472 members of Richmond’s cohort did not receive diplomas. 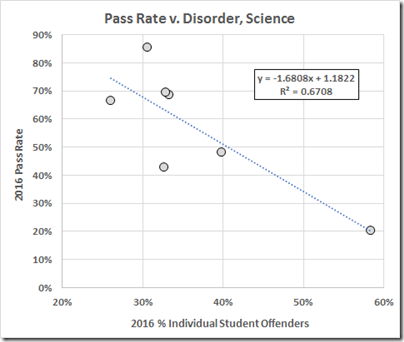 Excel was glad to fit provide linear least squares fits to the data. 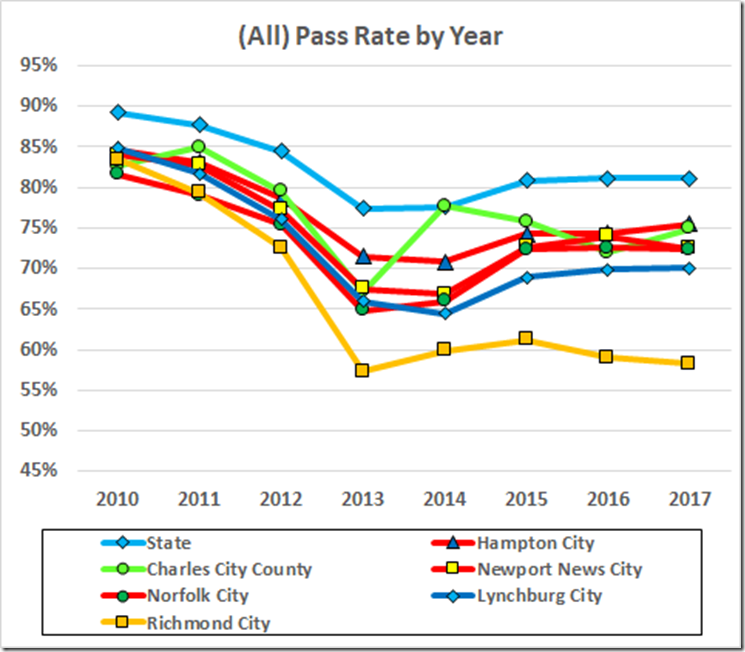 Those show the state rate improving by 1.2% per year over the period of the data and Richmond by 1.86%. 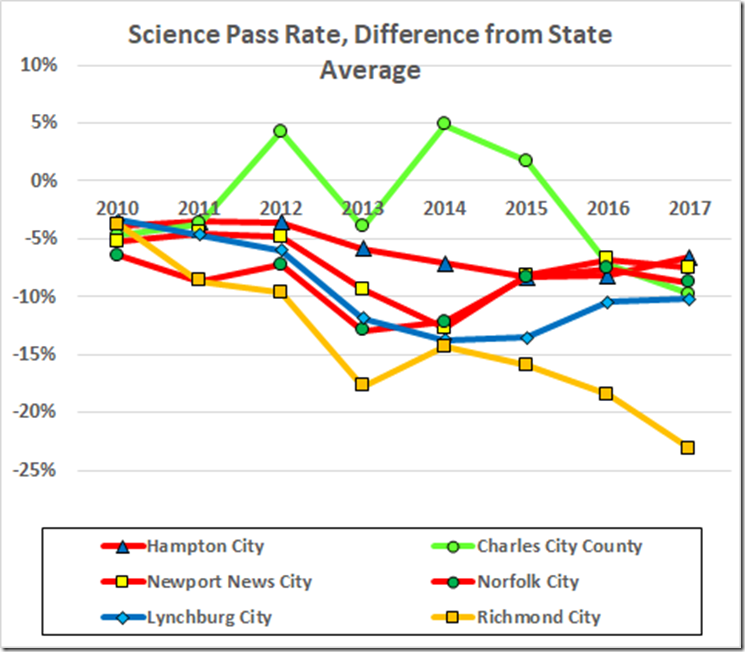 At those rates, Richmond would reach a 100% rate in 2031 and would catch the state in 2041. Of course that extrapolation is absurd. The extrapolated 2041 graduation rates are 118%. 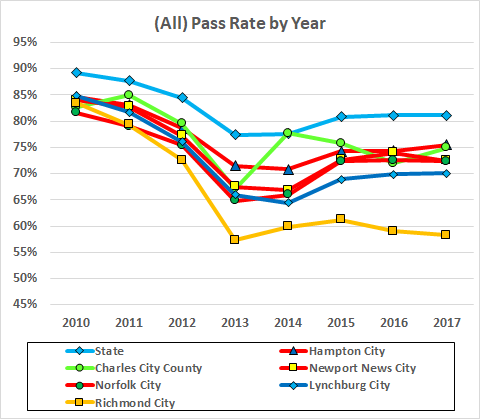 This being the real world, the rates of increase will decrease as the pass rates approach the 100% ceiling. Indeed, that slowing may already show in the state data. The point of the extrapolation is not at all absurd, however: It provides a measure of the dreadful job RPS is doing. 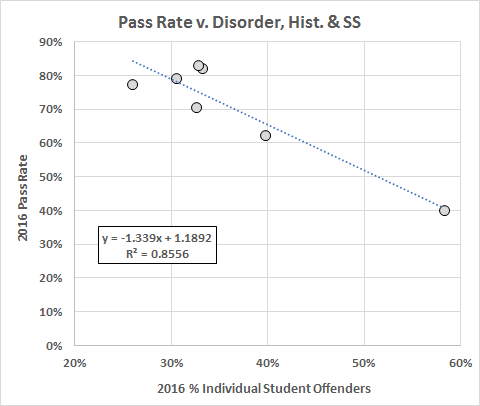 On the subject of “dreadful,” statewide there were 1.44 advanced diplomas per standard diploma in the 4-year cohort graduating in ‘16. In Richmond, that ratio was 0.63. 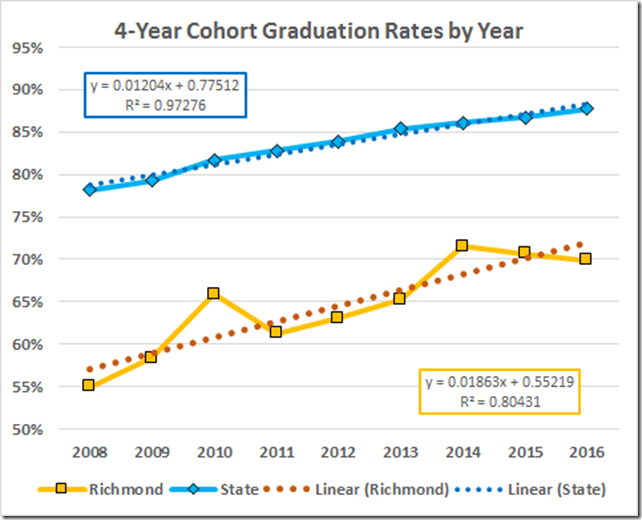 When looking at the cohort graduation rates, I tend to look at the 4 year rate. After all, four years is the normal time in high school. 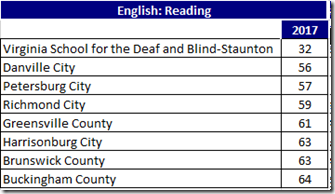 The helpful reports on the VDOE Web page also include five and six year data. For the class of 2016 (cohort of 2012-13) there can only be a four year report. 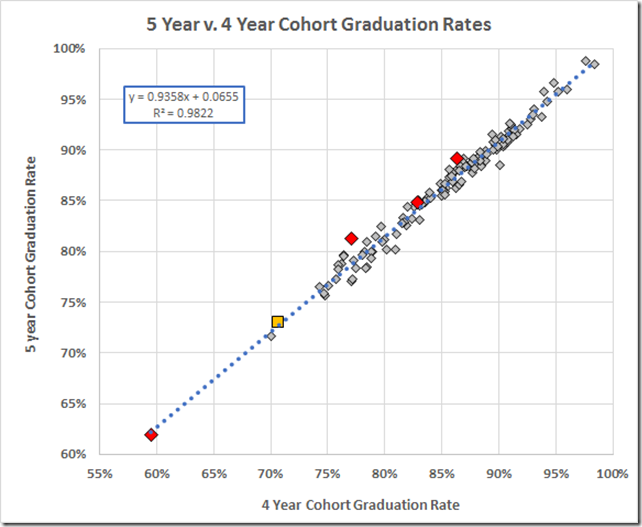 For the class of 2015 (cohort of 2011-12), however, the extra year opens the door to calculation of both a four and a five year rate. 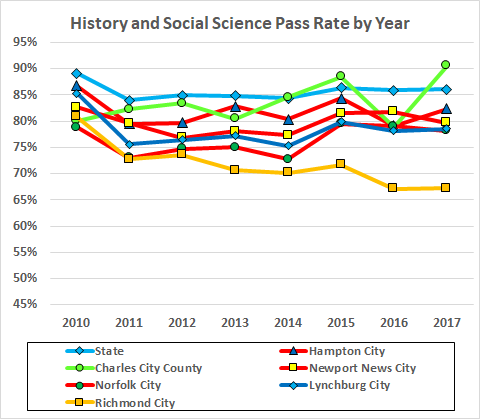 So I pulled the Class of 2015 data. 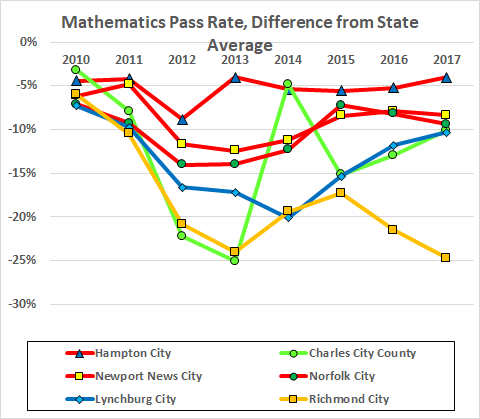 The rates below are the actual (standard and advanced diploma) rates, not VDOE’s inflated “on time” numbers. 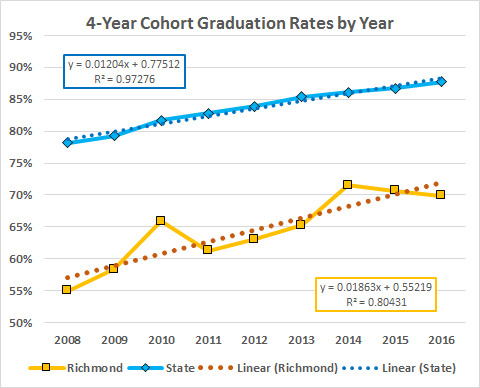 For a start, here is a chart of the division five year vs. four year graduation rates. Richmond is the gold square (sigh!). 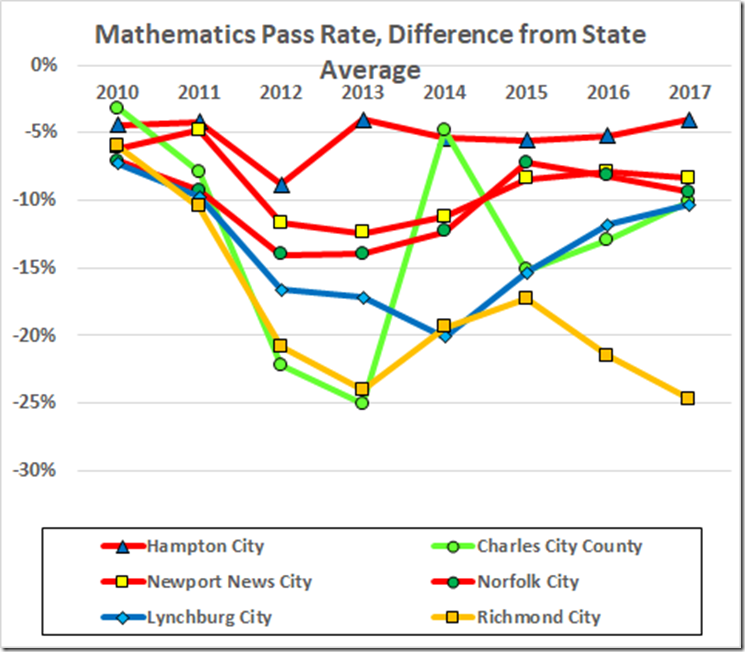 The red diamonds are, from the left, poor Petersburg (notwithstanding over twelve years of “help” from the State Board of “Education”) and the peer cities of Norfolk, Hampton, and Newport News. 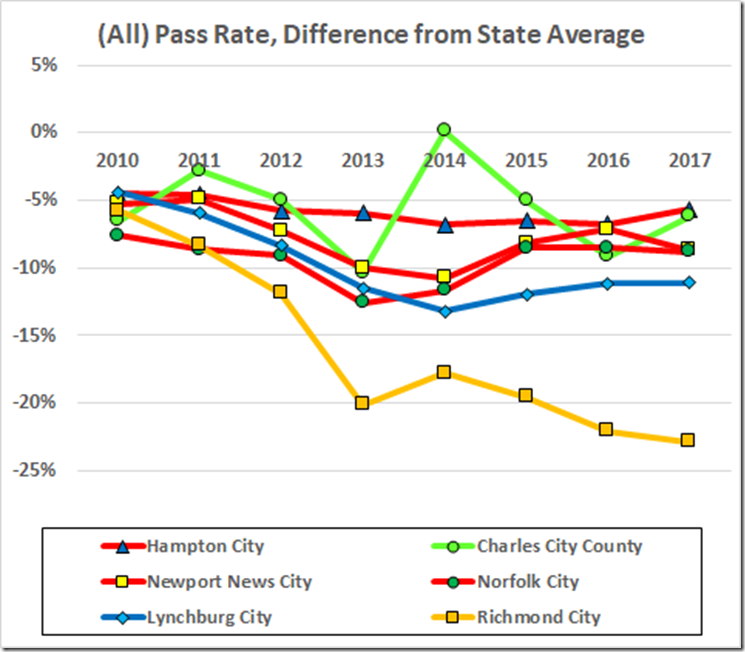 The R-squared of 98% tells us that the two rates correlate: Divisions with a high four year rate have high five year rates and those with low, low (see Petersburg and – help us, Lord! – Richmond). Highland County is omitted. 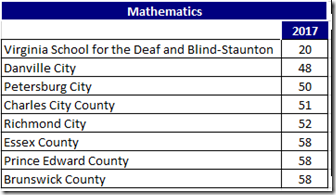 They had only eleven in the cohort and fewer than the cutoff (ten) in each category (VDOE suppresses data where there are <10 students). 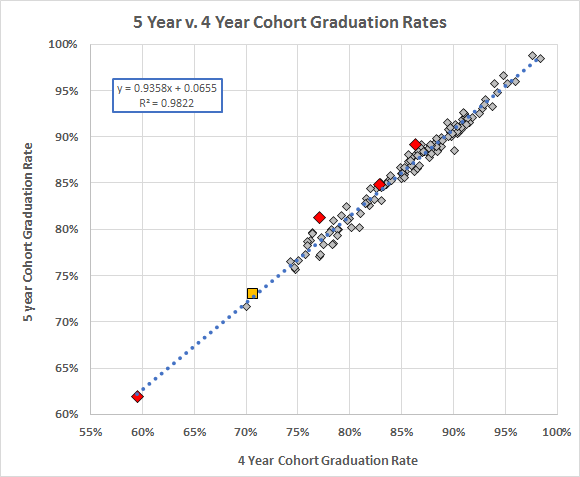 In many cases, the five and six year cohort sizes are different, apparently reflecting cohort members who leave or return during the fifth year. 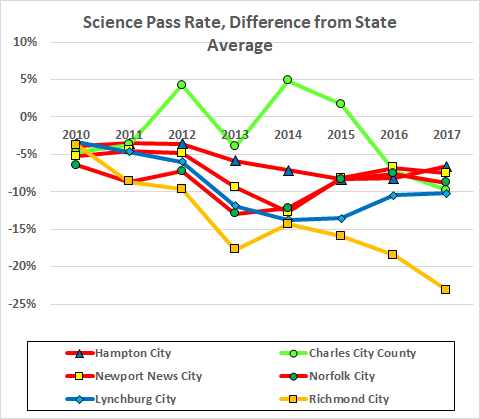 Thus, Cumberland County shows a 1.6% decrease in the five year rate, reflecting the same numbers of diplomas but an additional two students in the five year cohort. 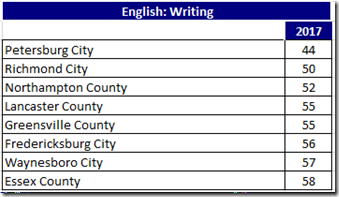 That sad point between Petersburg and Richmond is Covington. The two divisions at the upper right are Falls Church and West Point. The Richmond rates were 70.6% and 73.1%. Both are appallingly low. The (welcome) increase comes from thirty-eight kids who did not get diplomas in four years but now have them. Here is the breakout of the Richmond data. And here are the division data. 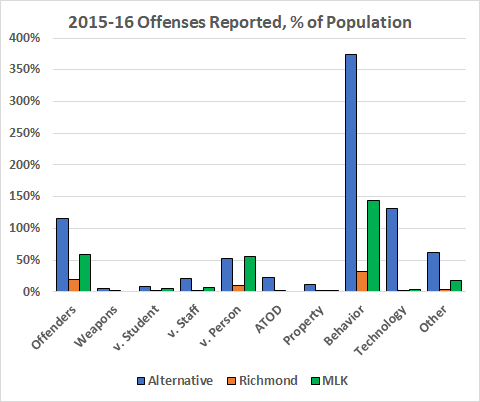 We have seen that Richmond had the lowest secondary attendance in Virginia last year: 88%. This happened in a context where Richmond earlier was ignoring the requirements of the state law regarding truancy and the Board of “Education” was ignoring its duty to require Richmond to obey that law. The number of warning letters sent to parents of students with ten or more unexcused absences. If the School Board has begun to attend to its duty under Va. Code 22.1-258, there doubtless will be multiple records responsive to each portion of this request. Please do NOT send me all of those; a single record responsive to each request (or a smaller number of records responding to multiple requests) would be plenty; an email with just the data, without production of the underlying records, would be even better. I have heard some speculation that the miserable performance of our middle schools is related to the disorder there. We have numbers for that. The VDOE Web site has a database, the Safe Schools Information Resource, with data on offenses and disciplinary outcomes in Virginia schools. 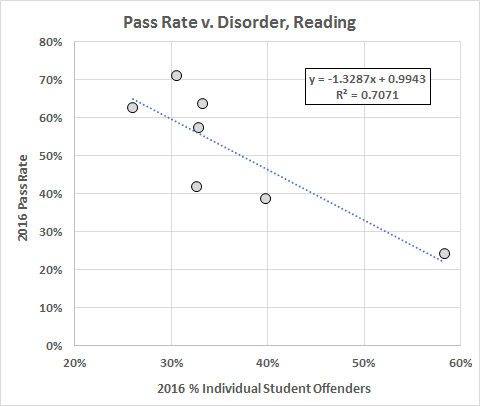 I take those data with a chaser of skepticism: The numbers are self reported by the schools and likely less that truthful. Nonetheless, these are the data we have. 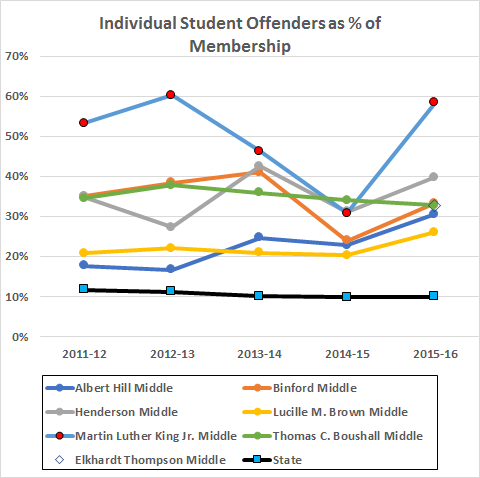 Here, from that source, are the numbers of individual student offenders for the Richmond middle schools, divided by the Fall memberships. 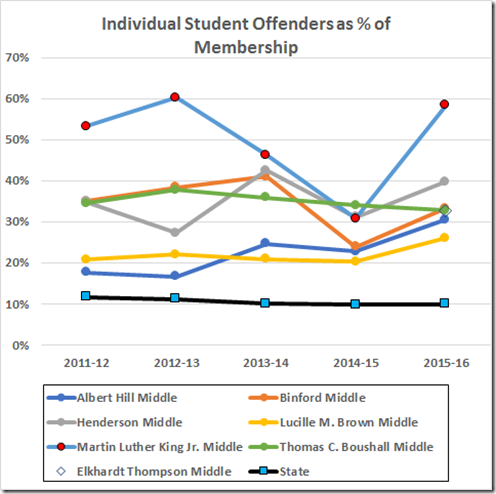 VDOE gives membership data for Elkhardt and Thompson before the conjunction but not offense data, so the graph shows only the 2016 Elkhardt-Thompson datum (at 33%, near the middle of the pack). 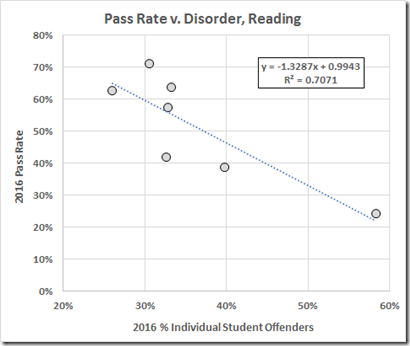 Can you imagine a kid trying to learn in a school where 58% of the students are reported as offenders? Or even 33% (which is over three times the state average for middle schools)? As it is, the kids in those schools don’t learn much. 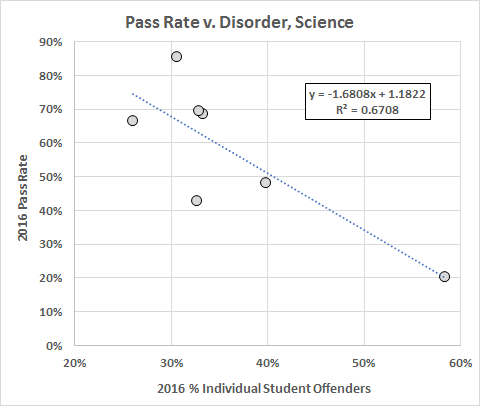 In that respect, let’s look at the 2016 SOL pass rate vs. the offender percentage. Even that substantial correlation does not imply causation but it’s hard to think this is a coincidence. 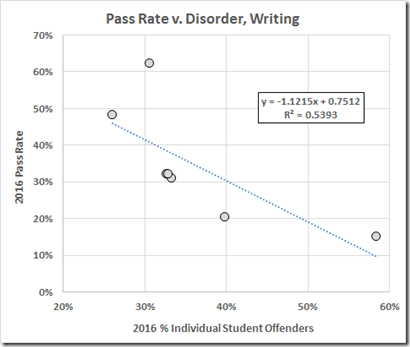 Data for the other tests tell much the same story. And remember, these same kids did much better in elementary school so the problem here has to be the middle schools, not the kids. 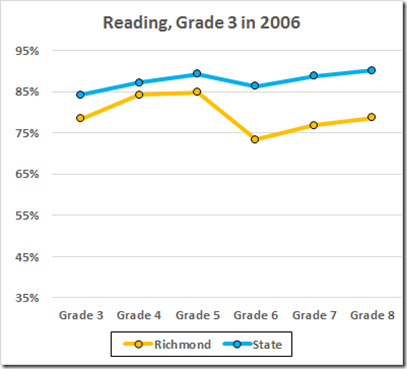 We have noticed that Richmond’s elementary schools have performed fairly well but our middle schools have not. 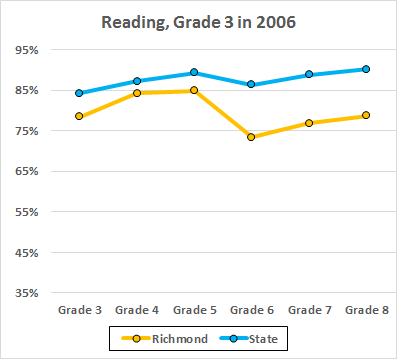 This suggests a question: Is it all those hormones affecting middle school students or are Richmond’s middle schools unusually awful? 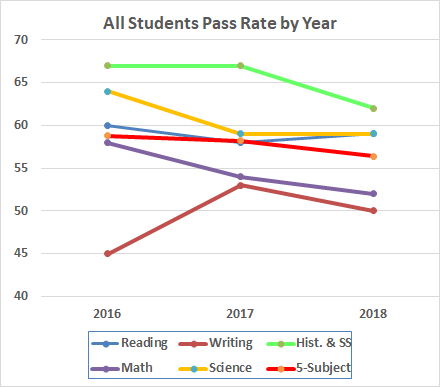 We can get a look at the situation by following class performance of the same group of students from year to year. 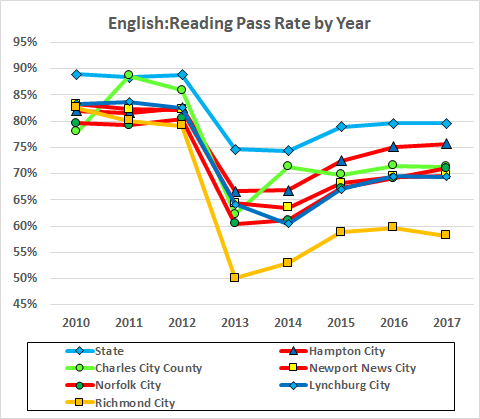 For example, here are the reading pass rates for Richmond and the state for third graders in 2006, fourth graders in 2007, etc., up to eighth graders in 2011. Hmmm. 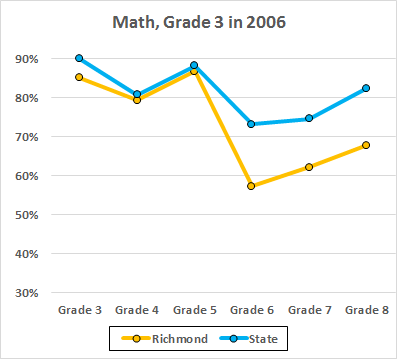 Hormones or not, it looks like Richmond took fifth graders who performed just below the state average in elementary school and dropped them by ten points in the sixth grade. 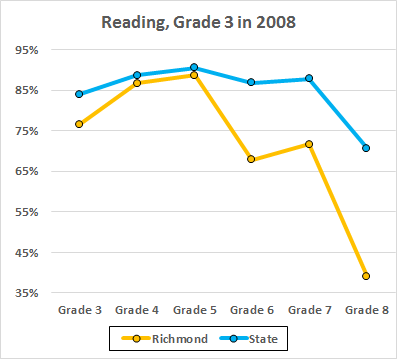 Here is the same graph, following the 2007 third graders. And the 2008 third graders. 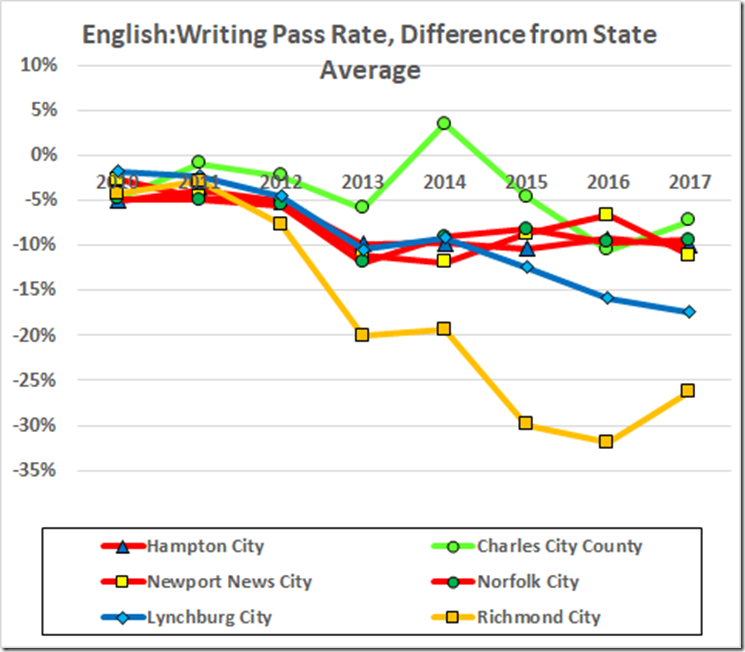 This last graph paints much the same picture (well, actually middle school performance was deteriorating), except that the new tests in 2013 lowered the state average for this group by seventeen points but clobbered the Richmond pass rate by thirty-three percent. 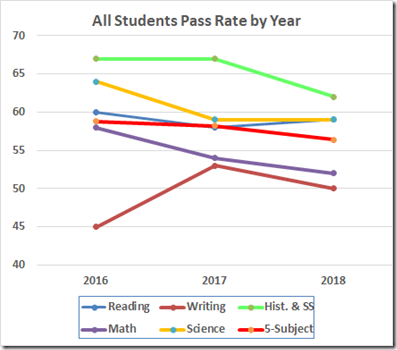 The math data show similar patterns, except that the new tests came in 2012 when the 2007 third graders reached the eighth grade. 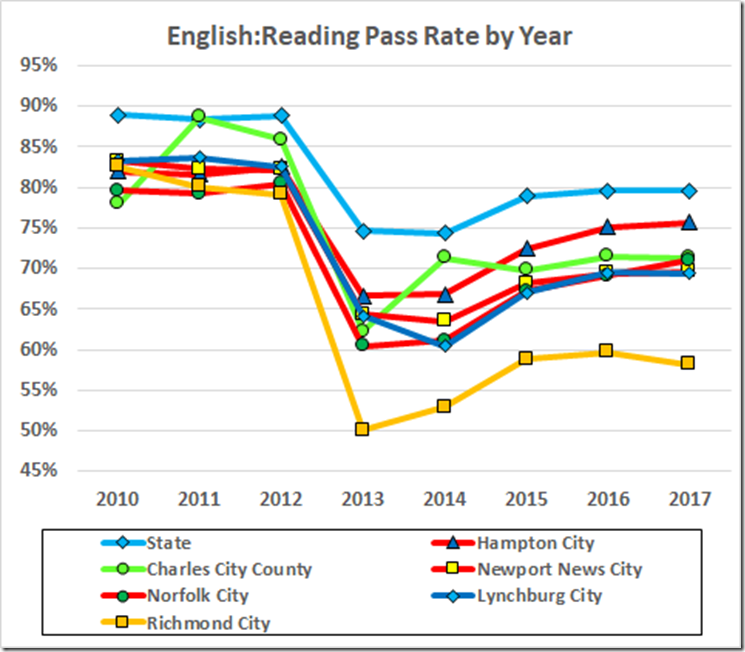 Thus we see that the pre-teen and early teen years have left reading performance essentially untouched and math performance somewhat reduced in Virginia but brought much impaired performance in both subject areas in Richmond. 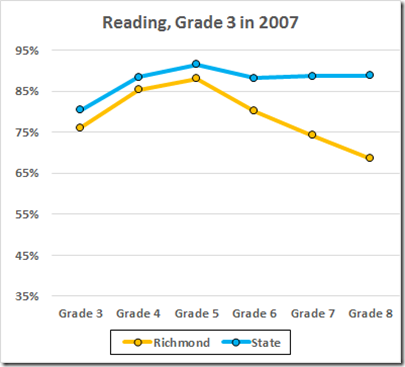 The obvious explanation: It’s not the kids; Richmond’s middle schools are particularly awful. But, then, we already suspected that. The program awarded grants to states that agreed to implement one of four intervention models in their lowest-performing schools: transformation, turnaround, restart, or closure. Overall, across all grades, we found that implementing any SIG-funded model had no significant impacts on math or reading test scores, high school graduation, or college enrollment. When we compared student achievement gains from different models in elementary grades (2nd through 5th), we found no evidence that one model was associated with larger gains than another. For higher grades (6th through 12th), the turnaround model was associated with larger student achievement gains in math than the transformation model. 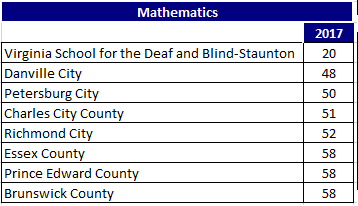 However, factors other than the SIG model implemented, such as baseline differences between schools implementing different models, may explain these differences in achievement gains. 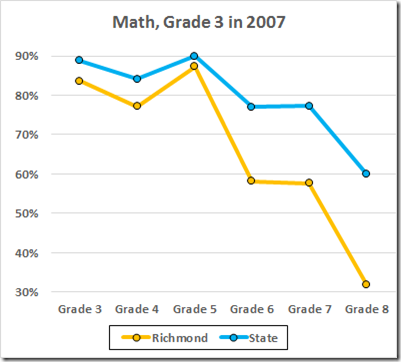 Is it any wonder, then, that our Board of “Education” does not know how to fix Richmond’s awful schools?